Amalthea is a moderate sized moon of Jupiter. Although it is relatively small, it’s the fifth largest natural satellite of Jupiter. It’s also the largest of the inner satellites of Jupiter. It was discovered in 1892, and is also known as Jupiter V. It’s tidally locked with Jupiter, as most moons are, especially those that are close to the planet. Amalthea is named after the nymph from Greek mythology who nursed the infant Zeus. She is sometimes represented as a goat who suckled Zeus in a cave on Crete, or as a goat-tending nymph who fed him the milk of her goat. 1. Amalthea was discovered by Edward Emerson Barnard on September 9, 1892, at Lick Observatory. 2. The colour of Amalthea is red, which is thought to either come from Io or some other non-ice material. 3. The largest crater, Pan, is 100 km across, covering a huge portion of one side of the moon. 4. Due to the size of Amalthea, its gravity should have pulled it into a more spheroid shape. However, it’s thought that the moon is made of a more rigid material, allowing it to retain its highly irregular shape. 5. If you were to view Jupiter from the surface of Amalthea, it would be 46 degrees across, or about one quarter of the sky from horizon to horizon. Due to the closeness of the satellite to Jupiter, and the high amount of radiation in that region, a clear image of Amalthea has never been taken. The image provided is from the Galileo probe, and is the clearest available. Aitne is a small moon of Jupiter’s that was discovered in 2001. It’s also known as Jupiter XXXI. Aitne is the diving personification of Mount Etna on Sicily. Her sons are the Palici, the twin Sicilian gods of geysers. Their father is Jupiter. 1. Aitne is a member of the Carme Group, which are small retrograde orbiting moons of about the same distance and inclination. 2. It was discovered by a group of astronomers from the University of Hawaii. 3. It had a temporary designation S/2001 J 11. 4. Scott S. Sheppard was the lead astronomer that discovered Aitne. 5. So little is known, there is no 5th interesting fact. No picture, either. Aegaeon is a tiny moon of Saturn, and is also known as Saturn LIII or S/2008 S 1. It was discovered by the Cassini team on August 15, 2008. 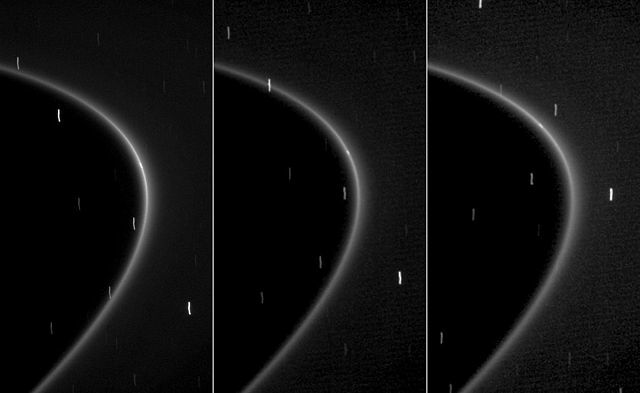 This series of images shows the movement of Aegaeon to the right of the ring. Aegaeon was named after Aegaeon, one of the Hekatonkheires, which were the children of Gaia and Uranus. They were seen as hideous monsters by Uranus and thrown into Tartarus. Later, Zeus rescued them and thought they would be good allies in the fight against the Titans. They were giants with 100 hands and 50 heads, and could throw 100 mountain-sized rocks at one time. 1. It orbits within the G ring of Saturn and is probably a major contributor to it. 2. It orbits in a 7:6 resonance with Mimas. 3. It’s the second smallest known moon of Saturn and second smallest in the solar system. 4. Although it’s suggested it’s 500 m in diameter, it hasn’t been measured. The size is based on the assumption that its albedo is similar to Pallene’s. 5. In mythology, Aegaeon was also known as Briareus. Due to the lack of information about this moonlet, the interesting facts were not very interesting. This is the first in the Solar System Moons series. 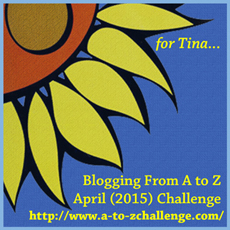 Each entry will go through the moons of the solar system in alphabetic order. This time, we will start with Adrastea. Adrastea is also known as Jupiter XV. The smallest of the inner moons of Jupiter, it was the first moon discovered by a spacecraft, Voyager 2. It was discovered on July 8, 1979. Very little is known about the surface of Adrastea, as it is very small and was not photographed very much at all. It’s known to be tidally locked to Jupiter and orbit at the edge of Jupiter’s Main Ring. Adrastea was named after the nymph who nursed the infant Zeus in Greek mythology. This was in order to protect him from his father Cronus. 1. It was the first natural satellite to be discovered not by a telescope, but by a spacecraft. 2. It’s thought to be the main contributor to Jupiter’s rings. It orbits at the edge of the Main Ring. 3. Very little is known about Adrastea, but if it’s like Amalthea, it’s thought to be composed mainly of water ice with a porosity of 10-15%, as its density is lower than water. 4. It’s one of only 3 moons that orbit its parent planet faster than the planet’s day. The other two are Metis, the innermost moon of Jupiter and Phobos, the innermost moon of Mars. 5. As it lies within Jupiter’s synchronous orbit radius, it will eventually crash into Jupiter as its orbit decays. However, as it appears to be just outside the Roche limit, it hasn’t been been broken up. And that is Adrastea. It’s not a well-known moon, since it hasn’t been studied much at all. The Galileo probe didn’t study it much, as you can see by the image taken by it. It’s pretty fuzzy. I hope you learned something about Adrastea.